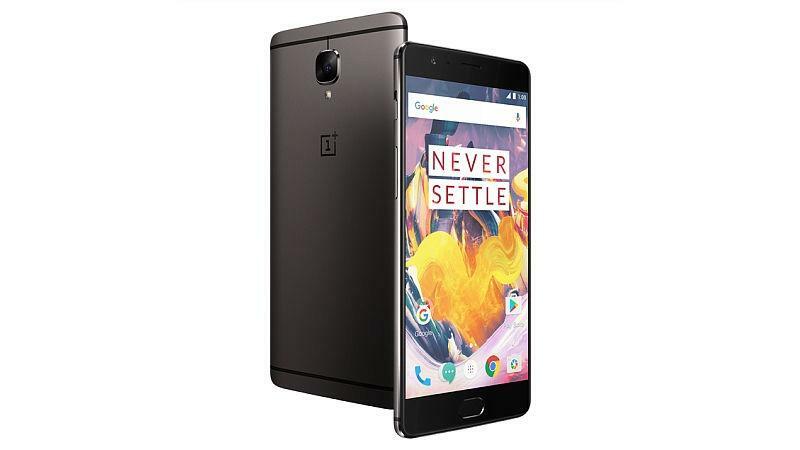 OnePlus on Friday launched the upgraded version of its flagship smartphone in India - the OnePlus 3T. The OnePlus 3T is priced at Rs. 29,999 for the 64GB inbuilt storage model, and Rs. 34,999 for the 128GB storage model, making it the most expensive OnePlus device yet. Both OnePlus 3T variants will be exclusively available from the company's online retail partner in the country - Amazon India - from 12.01am IST on December 14. The OnePlus 3T was unveiled globally last month, and has since gone on sale in the US, Europe, and the UK. The new OnePlus 3T smartphone features minor upgrades over its predecessor, the OnePlus 3, which was launched in June this year. OnePlus says it will begin manufacturing the OnePlus 3T in India from next month, starting with the 64GB variant. The biggest differences between OnePlus 3T and OnePlus 3 are the inclusion of a faster SoC, a higher resolution front camera, a larger capacity battery, and increased inbuilt storage. The new OnePlus 3T smartphone also comes in a Gunmetal colour variant, and foregoes the Graphite colour variant of the original. Like the OnePlus 3, the OnePlus 3T will also be made available in a Soft Gold colour variant, however, that will make its way to online shelves later. Notably, the 128GB variant will only be available in the Gunmetal colour variant, the company clarified. The dual-SIM (Nano-SIM) OnePlus 3T features an anodised aluminium metal unibody design, a fingerprint sensor on the home button, and a Alert Slider. The new OnePlus smartphone runs OxygenOS-based on Android 6.0.1 Marshmallow, and sports a 5.5-inch (1080x1920 pixels) Optic AMOLED display with Corning Gorilla Glass 4 protection. It is powered by a Qualcomm Snapdragon 821 SoC (with two 1.6GHz Kyro cores and two 2.35GHz Kryo cores) coupled with 6GB of LPDDR4 RAM. The OnePlus 3T features a 16-megapixel rear camera with a Sony IMX298 sensor, an f/2.0 aperture, OIS and EIS, and PDAF autofocus. The OnePlus 3T selfie camera has 16-megapixel resolution and comes with a Samsung 3P8SP sensor and f/2.0 aperture. The smartphone is available in 64GB and 128GB inbuilt storage variants. OnePlus 3T connectivity options include 4G LTE (with support for India's LTE bands), Wi-Fi 802.11ac, Bluetooth 4.2, NFC, USB 2.0 Type-C, 3.5mm headphone jack, and GPS/ A-GPS. OnePlus 3T is powered by a 3400mAh battery with support for the company's Dash Charge (5V 4A) fast charging technology. It measures 152.7x74.7x7.35mm and weighs 158 grams.